Dental implants are a cosmetic breakthrough for people who want to replace their missing tooth/teeth permanently. You can have one or more implants depending on your needs and the number of missing teeth. The most advanced solution for people with missing teeth is a dental implant in combination with a laboratory fabricated crown/dental bridge as it is more stable than a removable partial denture and more aesthetic than a fixed dental bridge. Improved confidence and self esteem- replacing missing teeth with highly functional, stable and aesthetic replacements. Improved comfort and speech- as you are replacing a missing tooth with a near replica, your tongue will think that everything is normal. Also if you have a denture there is increased bulk inside your mouth with the possibility of a denture moving around if ill fitting. Preserve tooth structure- there is no need to damage neighbouring teeth in comparison to a dental bridge. Improved eating ability- if implants are used to stabilise dentures, there is little movement of the denture when eating compared to if the dentures were supported by gums only. An initial consultation with your dentist is is required to assess your aesthetic and functional concerns and to determine if you are an ideal candidate for dental implant surgery. All risks and complications will be highlighted. Your dental and general health will be assessed, and the level of bone and density of bone will be verified through a CT scan and OPG. For those who do not have adequate amounts of jaw bone, an initial bone graft may required. For those with adequate bone density and levels, implants can be placed immediately after a tooth extraction or within a healed bone ( usually within 3-6 months after a tooth extraction). 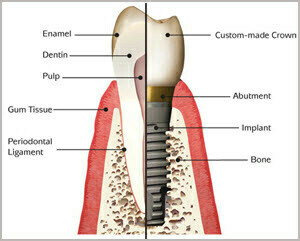 If an implant is placed once bone is healed the dental implant procedure is performed in two phases. Phase one of the dental implant procedure involves placing the implant. This involves the implant being surgically placed into the jawbone at the site of tooth loss. 3-6 months healing is required for the bone to osseointegrate with the implant which ensures that the implant will not move. Phase 2 of the dental implant involves restoring your implant with a dental crown, dental bridge or denture. 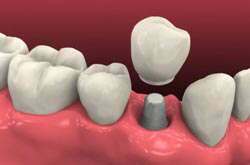 A conventional fixed bridge still remains an excellent treatment option. However, many individuals who have lost or who will be losing a single tooth may be hesitant to grind down their intact adjacent teeth, especially when the adjacent teeth are free of cavities or restorations. For these individuals, a single tooth dental implant may be the ideal option. As with any medical or dental procedure, the placement of implants may have a compromised success rate in certain individuals. Some of the reasons why you may not be a suitable candidate for a dental implant include: insufficient bone quantity, poor bone quality, inadequate amount of space between your upper and lower teeth, vital anatomical structure in close proximity to the proposed implant site, unrealistic expectations about the aesthetic outcome, or a still growing mouth and face. Certain chronic diseases such as diabetes, osteoporosis or gum disease can have the potential to interfere with the integration of bone to these implants. Individuals who smoke regularly will usually have a poorer prognosis for the implants in the long run. The long term success of implants is, in part, determined by meticulous oral hygiene and regular dental visits. Although you cannot develop cavities or periodontal disease with implants, it is possible to develop what is called peri-implantitis, which is inflammation of the tissues around the implants. To prevent this, brushing and flossing is important as well as your regular dental check-ups. If you would like to replace your missing teeth with a dental implant, contact us for a free consultation.